As regulators have all but removed marketing service agreements as a viable strategy, some lenders have withdrawn from that channel of business growth completely. Instead, lenders are focusing on building a strong co-marketing strategy with their agents and brokers — strategies that offer a host of advantages to both partners involved. But, co-marketing between lenders and agents or brokers is a different way of thinking. It's not a referral service for either party. Instead, it’s a way to match one company’s brand with another company’s brand and take advantage of their combined marketing power, while giving the end consumer a far better experience. Making it work requires a proactive marketing mentality. One of the major differences in thinking about co-marketing lies in the eventual goal. Although we’re all driven by a bottom line, co-marketing success begins with throwing away the idea that you join together with another party just to share expenses or double the amount of dollars you can spend on marketing. Instead, you’re in it to create new business, to generate a new source of clientele. Too often in the past, agents have asked mortgage partners to join them in new marketing campaigns. To be accommodating, lenders tried to fit the new ideas into their regular workflow and compliance approval processes, and it always doesn’t work. The marketing project gets delayed because language in an ad or mailer runs counter to what the lender’s marketing or compliance teams can allow. Both parties are frustrated at this point. Co-marketing agreements need to map it all out beforehand, and that begins well before the marketing pieces are created. There’s usually a reason a particular agent and a lender join forces in co-branding efforts. Successful partnerships identify that reason and then look at ways to use it. Why do your particular brands work together? Once you define why you work well as a team, you can map out what you can accomplish together and how to align sales, marketing and compliance efforts to get you there. Decide together what tactics work for your brands and your mutual goals. Then, you can decide who does what, how the costs should be split, what geographic areas need to be reached and which channels reach your intended markets best. A proactive approach in co-marketing also requires that partners create a consistent message. 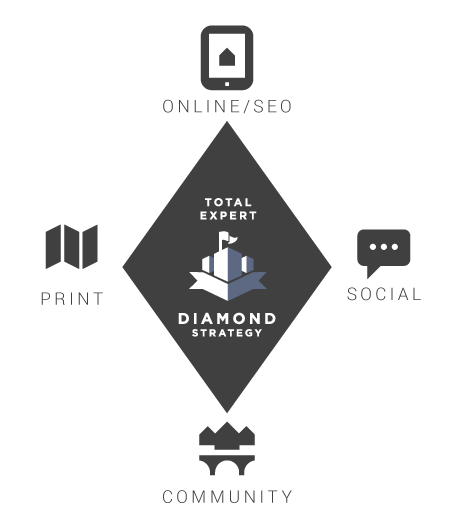 We often refer to The Diamond Strategy. In the middle of that diamond are your mutual goals. Once you have identified your mutual goals, use the four points of the diamond to create and spread your message. In the real estate business, we believe those four points are made up of a strong online presence, social media, print marketing and community involvement. All four of those points are needed in order to create consistent messaging. In a co-marketing situation, that doesn’t mean either partner has to sacrifice individual identity or already proven practices to work together. They should use their strengths in combination. In social media, for example, the agent may be comfortable presenting the message through channels such as Instagram, which lends itself to home selling because of the focus on pictures, while a lending officer may be more comfortable with paid media that targets people seeking certain financing terms. Meanwhile, you might put together printed materials for certain campaigns that reflect you as equal partners, while making it clear the choice to use one or both of the parties involved is the consumers to make. The message you’re providing together needs to reflect the co-marketing strategy you’ve built together so that you can build credibility in the target market. The most successful brands in the business know exactly what is working and why it's working. Then, they use that information to build on their success. Your measure key performance indicators and return on investment for your co-marketing efforts should be tracked. You also need to track what you’re doing up front so that you can determine each co-marketing partner's share of the cost to comply within regulations like the Real Estate Settlement Procedures Acts, Section 8. Keeping your co-marketing data in a centralized system helps ensure all your costs are secured, so you don't pay for any particular co-marketing activity without the proper documentation. Keeping this information in your database ensures you don't over pay either. When lenders and real estate agents co-market together, their marketing costs must be split proportionally. Additionally, be sure that if you are splitting costs on a marketing venture, that you are being shared on all leads that have been generated as a result of those co-marketing activities. Keep this new customer data in a single database and track all of your new acquisitions activity. Be sure you and your partner's goals align. This is a key reason co-marketing relationships fail. Road map your co-marketing strategy before spending any money. Determine the correct distribution channel for you co-marketing activity. Do not sacrifice your brand. Maintain a consistent message on all co-marketing activity. Identify ways you can track the success of your co-marketing activity. If you are not seeing the results you want, course correct and make adjustments. Store all your co-marketing data in a centralized system. As you look to take your co-marketing activity to the next level, consider reviewing our white paper covering the Four Co-marketing Pitfalls Mortgage Lenders Face.